On October 17th, Adam is participating in Extra Life, a 24-hour video game marathon to benefit children’s cancer research at the Texas Children’s Hospital. 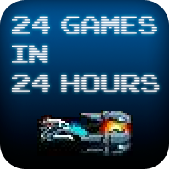 Adam’s twist is to play 24 different games in 24 hours, one per hour. And if people donate $24 they can pick one of the games he plays and the time slot when he plays it. I’m REALLY excited for him, and I’m doing whatever I can to get the word out. He’s going to put this logo (designed for him by his brother Morgan, a graphic designer for Sega) on my blog this week. I’m also planning a party for the night of the event to help Adam stay awake through the night (the marathon is 8am Saturday to 8am Sunday). So this is, of course, a chance for me to come up with a game-themed dessert table. I’ve got tons of ideas, I can’t wait. I’m waiting to pick my game and timeslot until I find out more about the new games coming out in the next few weeks. I feel like I should pick a game he’ll enjoy playing at an hour when he could use a break. He’s already got friends teasing him with impossibly boring and crazy games.